This picture should bring a smile to your face. I know it does to mine. It represents an era, a feeling, a vibe that is important to me. I realize a lot of you weren’t born when this photo was taken. 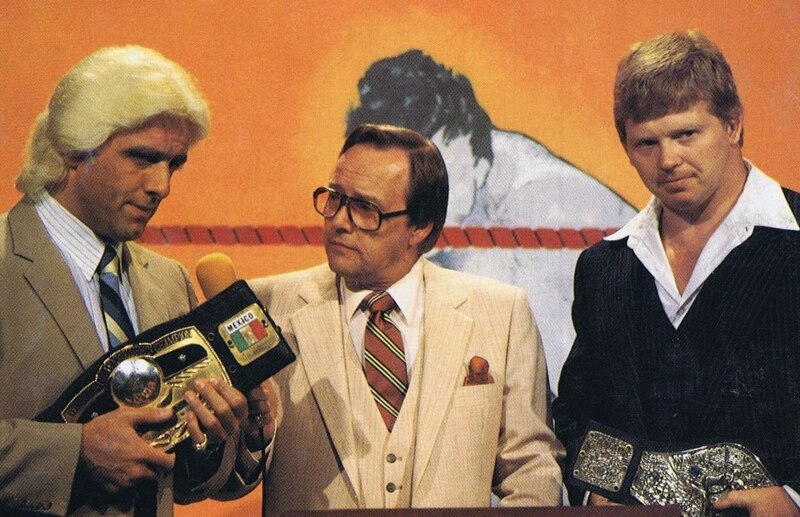 Rick Martel (as AWA Champion) and Ric Flair (as NWA Champion) were the class men of their organization. They were champions. Don’t worry, this isn’t a long tangent about titles not meaning anything but more importantly what the idea being a champion means. Being a champion means being the best. An idea that should drive each and every one of us. It’s the acknowledgment, a reward. One that requires days, weeks, months, years, decades of hard work. Every champion has a different story beyond the one written for them by others. Every person’s journey is very unique and ultimately very personal. FYI, this is beyond simply a wrestling post. A championship belt is a physical item. Actually being a champion is totally etherial. In reality, it’s how you carry yourself, it’s how you live your life, it’s the every day struggles and victories that build a legacy. The physical item is traded around as part of the never ending narrative in all sports; every sport has its version. It’s the feeling that comes with it and the chase that is the story here. We all chase being the best - the value proposition that goes with success. The title is a viewed award. I’m sure if you’ve ever held a championship title, you’ve spent time looking in the mirror… alone. That time is when you’re honest with yourself. There is no cameras, no fans, no other voices but your own. And even then you’re trying to convince yourself of that moment. Being a real champion means being honest with yourself on your journey. By attacking the part of you that drives you and the reasons you “lace them up.” Again, this is not just a wrestling post. Why do you get up? Why do you chase that title belt? Is it ego? Is it to get money? Is it recognition for a past you’re either running away from or running towards. Deep sh*t, right? The energy we create is the energy we not only attract but also foster the growth of. Positive or negative. There is never just one meaning in why we do things. There is always more below the surface. The chase of glory and gold reveals the drive of a man/woman. The pinnacle moment of raising the title over our head celebrates that chase. The fight and work to remain on top illuminates the dedication. Upon defeat, the ability to dust ourself off, look up at the mountain peak we’re just at and decide what’s next is the ultimate full-circle journey into who we really are. I’m about 99.9% sure I’ll not be hold a professional wrestling title over my head. If you’ve met me or ever watched me do anything athletic, you’ll understand why. But as I said, this is not a wrestling post. It’s about each of our journeys to be a champion in our own lives. I’ve lived each of these steps and crave each more because they help me grow and get better. Every time I get knocked down in the dirt I wonder how I can get back up to that peak again. It sure looks far doesn’t it? My peak is different than yours; everyone has their own journey and path. Celebrate it, embrace it, live it. Your journey is solely yours - lived, executed and defined by you. The title belt you hold up at the end of your story is the sweetest when you’re truly your own champion.